A bacon muffin (left) & banana chocolate Danish (right) from Some Crust Bakery in Claremont. No one should eat the banana chocolate Danish at Some Crust Bakery in Claremont -- at least not for breakfast and definitely not by yourself. I'm not saying I couldn't. (Don't tempt me.) I'm just saying we all have a pair of skinny jeans, real or metaphorical, that we want to fit into, and this behemoth of a breakfast pastry seems like it was invented solely to foil those attempts. Some Crust's banana chocolate Danish is the Andre the Giant of Danishes. Pregnant with banana cream, it can barely be contained by a standard salad plate. This isn't one of those pastries topped with a few miserly drizzles of chocolate. This sucker is covered nearly edge to edge with a quarter-inch layer of dark chocolate that must be the caloric equivalent of two Hershey bars. Some Crust is not a bakery to be trifled with. 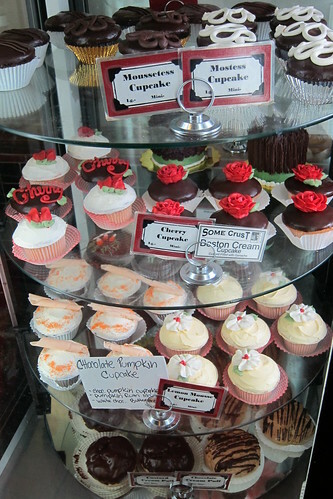 Their cupcake varietals extend into the dozens, lovingly merchandised in a multi-tiered glass case at the back of the store -- right where the line of customers often ends. Where some eateries will add bacon to any recipe, clumsily trying to cash in on the food trend, Some Crust makes a bacon muffin where the signature elements are perfectly married. Halfway between cornbread and a standard muffin, the cake betrays a hint of sweetness, perfect for setting off the considerable chunks of salty bacon that embedded throughout.